AFL player Paul Chapman, and his partner Lauren Smyth, welcomed their first child on January 29 and have named their son Myles. Paul starts his first season with Essendon this year, having played with Geelong since 2000. Jockey Adrian Patterson, and his wife Donna, welcomed their second child on February 4 and have named their daughter Tayla Amelia. Tayla Patterson weighed 3.49 kg (7lb 7oz) at birth. Adrian is currently recovering from surgery on a shattered collarbone, and hopes to be back on the track by the end of next month. 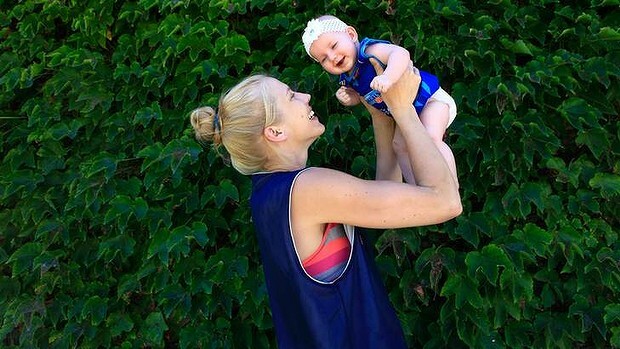 Basketball star Abby Bishop [pictured] became a foster-mother to her niece Zala Kate in August last year, taking her home from hospital when she was two days old. Zala is the daughter of Abby’s sister Chloe, and Abby will have custody of Zala for at least a year. Zala has the same middle name and surname as Abby, and Abby and Chloe are in regular contact to share details about Zala’s life and progress. Zala, or Zdog as she is known, has become a “team mascot” to the Canberra Capitals, which Abby plays for; she also plays for the national women’s team, the Australian Opals. know nothing about Australian basketball or this celeb, but cant help but wonder WHY is Abby taking care of Zala for a year??? seems very odd that Chloe is…what?…busier than her basketball star sister and can’t take care of her child for a year???? The story doesn’t say, so I guess they don’t think it is any of our business. But she isn’t necessarily “busy” – she could be ill, or have special needs, or be extremely young, or have something else that needs to be taken care before she can care for someone else. It didn’t say for a year – it said for at least a year. Either way, how wonderful that Abby was able to step in and be a foster-mum to her niece when she needed her.